I was tagged by Shane (zoomstart) to join in on a meme, who in turn was tagged by Rob (yack yack). This is not the first time I have participated in a meme, the first one was Blog Apocalypse. This one as the heading says is the challenge to write a post about why I blog. You know how these things work. You write whatever the meme calls for and then you tag 5 more people to do the same thing to keep it going. We all have our own special ways how we relax, and that includes me. This photo here depicts one of the two ways how I relax — throw caution to the winds and be totally carefree! My other way of relaxing is — you guessed it — blogging. I was stuck in Bahrain’s notorious traffic once again the other evening, and I found my thoughts wandering to blogging, and why I do it. Several explanations popped into my head, including money-making, impressing my new boss, or my neighbour’s teenage daughter, killing time, a reason to learn PHP and CSS, what not. All my expertise in lying to myself wouldn’t help me accept any of these explanations. There was something else. And just as the traffic started moving again, the answer came to me. You see, an artist likes to see his signature on his painting. A writer is passionate about his name in print. A copywriter will stare at his creative ad for ages. All of them have something in common — they are expressing themselves. I see a kind of quiet satisfaction when something I have to share is made public for others to read — whether they accept it or reject it, that’s none of my business. My concern is for the serene happiness it gives me when I hit the bed every night. I asked myself, if my goal was to make $15,000 per month from blogging, and if someone offered to pay me the same amount every month for doing nothing, would I stop blogging? No, I wouldn’t. Certainly not. It’s not about money. It’s something money can’t satisfy. In my case, it’s simply called passion. A passion for expression. Next story How to pick a Stock Broker? Those are pretty cool reasons to blog. Thanks mate, I guess those are cool enough reasons to blog. Needless to say that I have also met wonderful folks here and made some good friends with co-bloggers. That makes this blooging journey more interesting. Great answer! When you do the things you can’t not do, it shows. People see it. They can’t not see it. Blogging is really an outlet and platform for everyone to express and publish their views. Thank god for blogs! I am glad you accepted the tag mate and sure once again, thank GOD for the blogs. Blogs definitely give us the chance to express and publish our views. You are most welcome mate and I am sure you will come up with something exciting on why you blog. Looking forward to see that post. Thank you for the tag, it’s appreciated. I love your reasons for blogging, especially having a passion for expression. Now that would make a great title for a meme. Thanks for liking my reasons for blogging, well thats simply me, just myself and thanks for accepting the tag mate. I appreciate that. I agree with you, expressing myself (to me) is the ultimate reward i get from blogging, just as when i finish recording a guitar track in the studio, and listen to it. 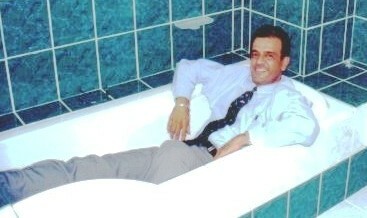 Yeah cool pic…lol, 😉 wonder why and how I got that idea of getting myself photographed fully clothed in a bathtub and since I didn’t see anything destructive about it, I went ahead..:lol:. Glad you found this post inspiring. Would love to listen to some of your guitar recordings. That’s SOME classy inspired writing there, Robs! You have a special point of view about blogging. I’d imagine there are quite a few bloggers out there, who are doing it without really seeing the reason why they’re doing it. It’s great that you’ve been able to identify and articulate your perspective in such style. Thanks a lot mate, glad you liked my point of view and as I said earlier, thats just me. You have used strong words to appreciate this post, Thanks again. I blog is because it is my business, I make my living from it.It is very interesting to see what other people are up too as well and I find new interesting sites everyday.